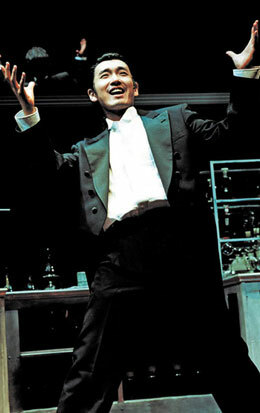 Cho Seung-woo performs on stage in the musical "Jekyll and Hyde." Actor Cho Seung-woo will make his comeback with the musical that made him famous, "Jekyll and Hyde," after completing his military service. He will again appear in the starring role when a new production of the hit show opens from Nov. 28 at the Charlotte Theater in Seoul. "It seems a bit early to confirm this as he is still serving in the army, but Cho will meet audiences again through the musical 'Jekyll and Hyde'," Cho's management agency PL Entertainment said. "He is one of the few actors who has found success in both films and musicals." Before he entered the military, tickets for the shows in which Cho performed used to sell out on the day they went on sale, and sold for double or triple the original price at auction websites. The musical seems to be especially meaningful for the actor as well. "Cho's acting career can be divided into before and after 'Jekyll and Hyde'," said PL Entertainment CEO Song Hye-sun, as he rose to stardom when the show premiered in Korea in 2004. Cho later appeared in a number of memorable works such as the musicals "Man of La Mancha" and "Hedwig and the Angry Inch" and the hit films "The War of Flower" and "Running Boy." In anticipation of Cho's return, PL Entertainment has received a stack of nearly 100 scenarios and scripts for films and musicals since early this year. "Jekyll and Hyde" tells the story of Dr. Jekyll who is accused of blasphemy for his scientific experiments trying to separate good and evil. When he tests one of his potions on himself, the doctor is transformed into the evil Mr. Hyde. Cho's performances were hailed by critics for his intense charisma together with flawless vocalization and acting. Cho is currently serving his military duty in an acting troupe under the Seoul Metropolitan Police Agency. The group performs plays and shows for the disabled, senior citizens living alone, and children.